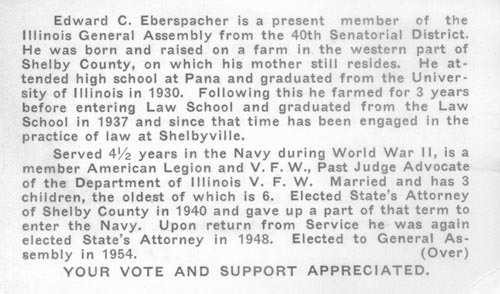 For Representative in the General Assembly, 52nd Representative District, Christian, Jersey, Macoupin, Montgomery and Shelby Counties, Edward C. Eberspacher of Shelbyville, Illinois. 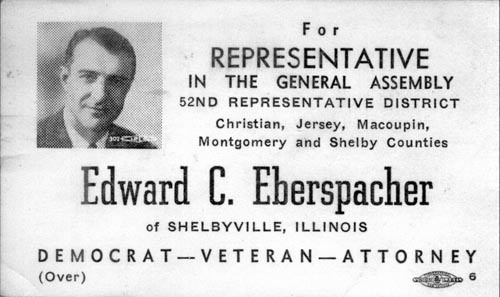 Are you looking for EBERSPACHER ancestors? If so, we suggest posting a query to our Community Message Board to get assistance from other researchers.